These Baronial IvoryClassic Crest covers is FSC Certified, Green-e certified and made Carbon Neutral Plus. 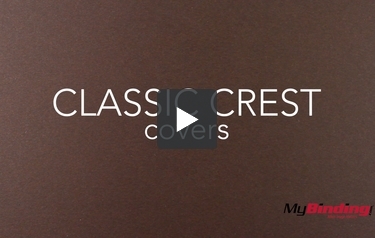 The Baronial Ivory Classic Crest cover deliver exceptional performance on a wide variety of equipment from laser and inkjet printer to color copier and digital printer press. Acid free, Baronial Ivorycovers are made from 80lb stock and are available unpunched or pre-punched with your preferred binding pattern (see list below). Our window covers have a 1.75" x 4" window that is centered on the front cover 3" from the top edge. With more than 200 options, be sure to pick the right one!